New office drama is debuting this week. Starring young and rising stars like Go Ah-sung, Ha Seok-jin, and Lee Dong-hwi, Radiant Office is making Korean drama fans excited to see something new. On Monday, March 13, Radiant Office had a press conference previous to its premiere on Wednesday, March 15. At the event, producer Jung Ji-in and cast members Go Ah-sung, Ha Seok-jin, Lee Dong-hwi, King Dong-wook, and Infinite member Hoya made appearances. Radiant Office is a workplace romantic comedy drama that centers around Eun Ho-won, a novice at work who has nothing to lose after the diagnosis of terminal illness. As there is another workplace drama, namely Good Manager, airing at the moment, it is hard not to compare the two pieces. “There have been a good number of workplace dramas recently and I was worried that we can’t avoid comparisons to them,” said Jung Ji-in, director of Radiant Office. “We tried to depict the inferior / superior workplace relationships that are observable on a daily basis. And the drama also focuses more on the workplace hardships female workers experience,” explained she. Lee Dong-hwi and Hoya of K-pop boy group Infinite give another reason to watch the drama. 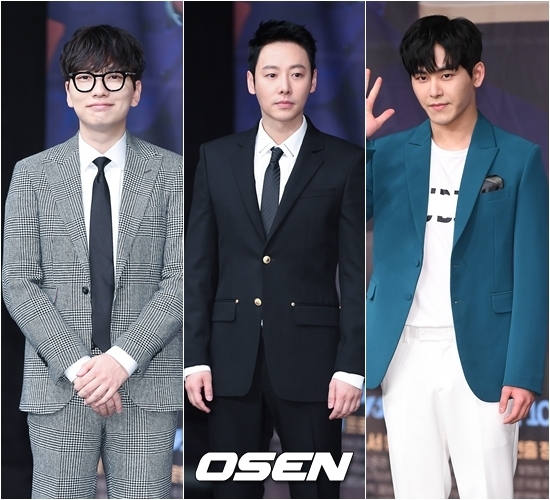 Go Ah-sung, Lee Dong-hwi, and Hoya will illustrate workplace friendship. MBC’s new drama, Radiant Office, will air the premiere on March 15 at 10 PM KST.